My mother-in-law gave me $20 in nickels for my birthday (that’s 400 nickels if you’re counting with me at home), along with a jar that counts coins as you drop them in through a slot in the top. If the jar is accurate, I have 490 nickels in there currently. Add to that the 21 nickels I have in my PayPal account, and I’m up to 511. Only 31,489 nickels to go. Sweet! If you’re paying attention, the number of nickels in my PayPal account hasn’t changed at all since my last update. Is a nickel too much to ask? Come on all you PayPal users out there! Click the button. I dare you! What’s all this about, you ask? Check out the original post for details. And what’s the head count (no pun intended) so far? 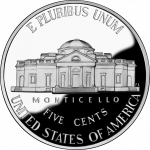 How many nickels? Well, it’s rather depressing, actually. I really need to start spreading the word a bit further than just my little circle of influence. I’ve got some ideas for making this little project go viral, but it’s all a matter of working up the time and energy required to put those ideas into action. The grand total right now is 59 actual physical nickels in a cup in my desk drawer and 21 virtual nickels in my PayPal account. 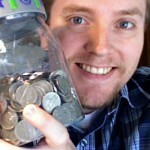 That’s 80 nickels all together, making the grand total $4.00 even—one four-hundredth or 0.25% of my goal. Another 31,920 nickels to go, and I’ll have my MacBook. Things are looking up! Can you spare a nickel? I’m kicking off an experiment to see if I can raise enough money to buy myself a Macbook. But here’s the catch: I’m planning to raise the money entirely in nickels. Doing the math, the roughly $1,600 it will take to buy a Macbook works out to 32,000 nickels. So far I’ve got 6 nickels sitting in a cup on my desk. Hey, it’s a start! So here’s the deal: I’m shamelessly asking you to toss five cents into my PayPal account. This money will not go to charity or a non-profit of any kind and is most certainly not tax-deductible. It will go straight into my pocket. You’ll get nothing in return for this, but hey, why do you care? It’s only a nickel. And that’s the whole point: I’m not asking for much—just a few seconds of your time and a nickel. Update: I’ve blogged about this again since this initial post. To follow my progress, see the following posts. Anybody out there heard of Chesspark? It’s a new online community for chess players. I’ve recently joined and am looking for people to play with. If you join, feel free to add me to your contact list. My username is ‘joeyday’.